This week’s dPS challenge is silhouette. I pondered, as usual, what this might mean. The dictionary wasn’t much help – an outline containing a solid block of colour, often dark against a light background. This time, it proved more useful to think about where I’d seen silhouettes in use. I remembered the black and white portraits so popular in the 1800s, where the subject often sits behind a white sheet onto which their back-lit profile is projected. I remembered cameo brooches, small and intricate. I remembered film noir, with the tension created by the imposing silhouette of impending danger. An interesting silhouette seems to contain both mystery and meaning. On the technical front, this week it was the auto exposure bracketing (AEB) that came in handy. The silhouette was often strongest in the slightly underexplosed shot. But I found today’s photos were also quite blue. So I played with the colour in post-production and decreased the saturation a bit. They are still a bit blue, but not quite so garrish. Turns out, I forgot to adjust the white balance after my last bout of indoor photography. The other issue I continually forget when on the road (aside from my fluorescent waistcoat) is the impact of the wider angles on vertical items such as street lamps. 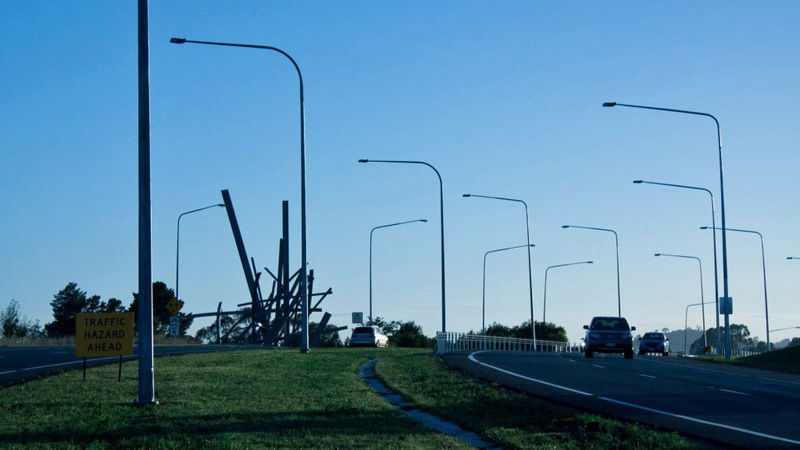 The main shot above had to be rotated slightly to straighten the street lamp. 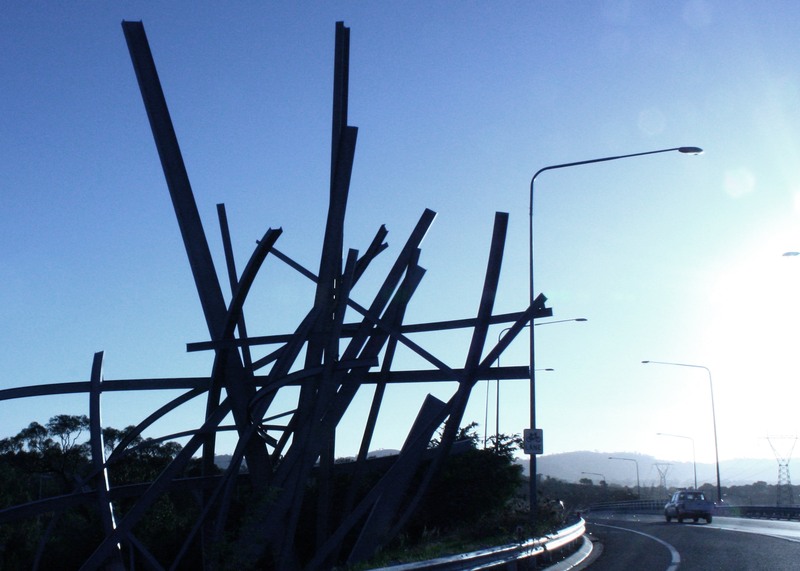 Some people disapprove of road-side sculpture, claiming it to be a publicly-funded driver distraction. They would probably approve of the sentiment captured in this next shot. 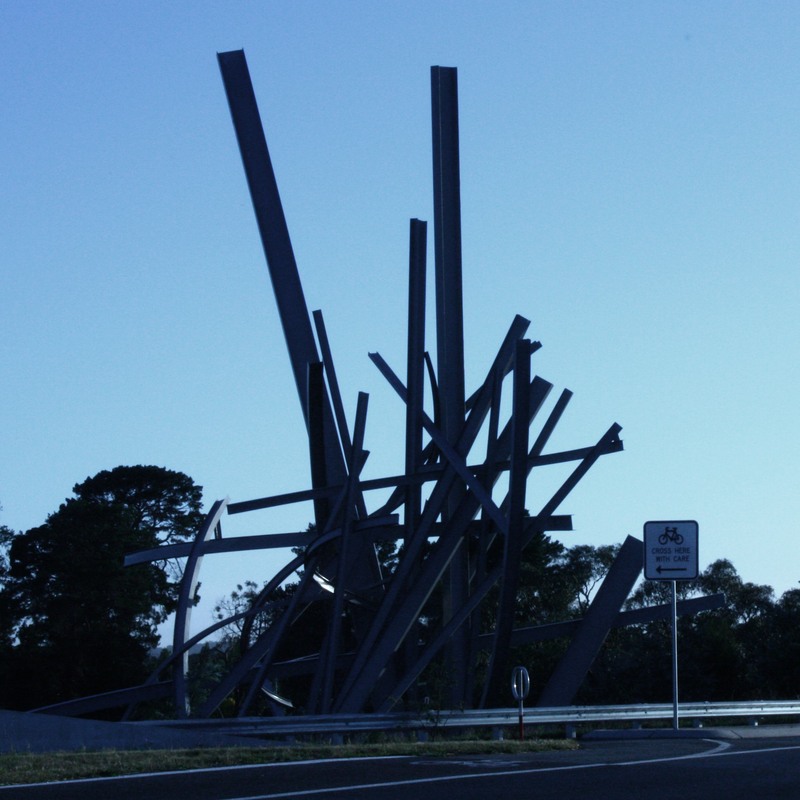 I just love sculpture … and prefer them to billboards. Photographic Series – Road’s Edge – the location where the new surface butts up against, or overlays, what was previously there seems heavily imbued with so many of life’s challenges and society’s problems; perhaps even some solutions.